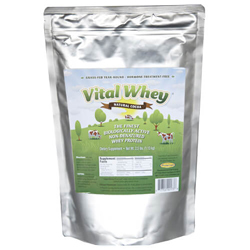 Vital Whey®, by Well Wisdom LLC, is a delicious, 100% natural nutritional protein perfect for adults and children. Vital Whey® is the finest biologically-active, non-denatured native whey protein®. It is minimally processed to maintain the full range of all the fragile immune-modulating and regenerative components naturally present in fresh raw milk. Vital Whey® Cocoa is a flavorful, 100% natural protein supplement perfect for all ages. It is also a great way to manage your appetite and sustain energy throughout the day. Vital Whey Cocoa fits in at home as a healthy snack for parents and their children, as well as at the gym for the perfect protein boost after a hard workout. Anyone interested in maintaining a healthy lifestyle will agree it is the Vital Whey to good nutrition. Suggested Use: Mix one scoop into 4 to 8 oz of water, milk or dairy substitute. For best results mix in a blender or shaker. Store in a cool, dry place.